"It killed me today. I had a guy here with me and he popped it back in five times." 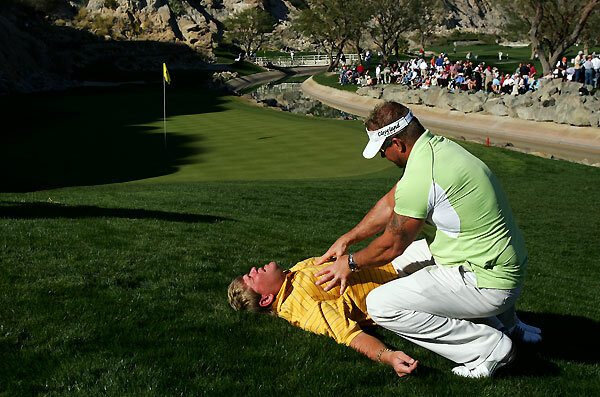 Daly's rib injury dates back to the Honda Classic last March when he was disturbed on his back swing by a spectator trying to take a photograph. "A woman took a picture and I came down and separated my shoulder and fractured my rib," the 1995 British Open champion said. "I tried to play through it all last year and had to withdraw from tournaments because it kept popping out. Why would John sue a tournament where most of the profits go to a children’s charity run in part by the Jack Nicklaus family? One look at Daly’s golf bag may show why: There are no logos of an equipment company on his bag. Daly, who has the talent and the charisma to be one of the high-paid endorsees on the PGA Tour, is once again without a company. So maybe that’s why he’s willing to gamble by possibly suing a tournament that gave him a sponsor exemption — Daly actually has asked for another sponsor exemption from Honda for this year! Honda Classic tournament director Ken Kennerly has tried to remain low-key, saying he can’t comment on a lawsuit that hasn’t been filed. But when the Golf Channel reported last week that Daly has decided to file the lawsuit, other tournament directors took notice. Daly has been a regular this week at the Hope's tournament parties. He attended two more tournament parties Friday night, including an after-party, and told one local reporter to ignore the fact that he was drinking. At the first party, Daly sang "Knockin' on Heaven's Door" in a duet with Alice Cooper. Eyewitnesses said Daly was helped out of the after-party by an unidentified man.